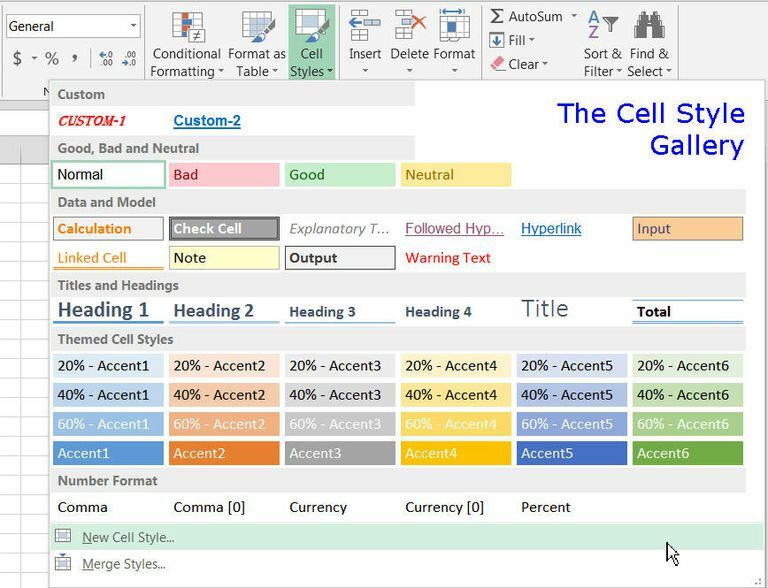 A cell style in Excel is a combination of formatting options - such as font sizes and color, number formats, and cell borders, and shading - that is named and saved as part of the worksheet. Excel has many built-in cell styles that can be applied as is to a worksheet or modified as desired. These built-in styles can also serve as the basis for custom cell styles that can be saved and shared between workbooks. One advantage to using styles is that if a cell style is modified after it has been applied in a worksheet, all cells using the style will automatically update to reflect the changes. 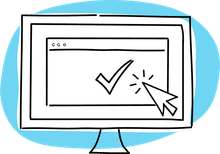 Further, cell styles can incorporate Excel's lock cells feature that can be used to prevent unauthorized changes to specific cells, entire worksheets, or entire workbooks. Cell styles are based on the document theme that is applied to an entire workbook. Different themes contain different formatting options so if a document's theme is changed, the cell styles for that document also change. Click on the desired cell style to apply it. Click on the Cell Styles option on the ribbon to open the Cell Styles gallery. The formatting options already applied to the selected cell will be listed in the dialog box. Click on the Format button in the Style dialog box to open the Format Cells dialog box. In the Style dialog box, under the section entitled Style Includes (By Example), clear the check boxes for any formatting that is not wanted. The new style's name is added to the top of the Cell Styles gallery under the Custom heading as shown in the image above. To apply the new style to cells in a worksheet, follow the steps list above for applying a built-in style. Open the workbook that the style is being copied to. In this second workbook, click the Home tab on the ribbon. Click on the Cell Styles icon on the ribbon to open the Cell Styles gallery. Click on the Merge Styles option at the bottom of the gallery to open the Merge Styles dialog box. At this point, an alert box will appear asking if you want to merge styles with the same name. Unless you have custom styles with the same name but different formatting options in both workbooks, which, by the way, is never a good idea, click the Yes button to complete the transfer of the style into the destination workbook. On the Home tab of the ribbon, click on the Cell Styles icon to open the Cell Styles gallery. At this point, the modified cell style will be updated to reflect the changes. The new style's name is added to the top of the Cell Styles gallery under the Custom heading. To remove a cell style's formatting from cells of data without deleting the cell style. Select the cells that are formatted with the cell style that you want to remove. In the Good, Bad, and Neutral section near the top of the gallery, click on the Normal option to remove all applied formatting. The above steps can also be used to remove formatting that has been applied manually to worksheet cells. With the exception of the Normal style, which cannot be removed, all other built-in and custom cell style can be deleted from the Cell Styles gallery. If the deleted style had been applied to any cells in the worksheet, all formatting options associated with the deleted style will be removed from the affected cells. Right-click on a cell style to open the context menu and choose Delete - the cell style is immediately removed from the gallery.